Paperback – Price $23.00 (+$6.00 S&H) USD. Room 4, is a compilation of seventeen stories of vivid childhood memories by 87 year old author and artist Beth Ford who spent ten years from 1933-1943 growing up in the McColgan Hotel in McComb, Mississippi. 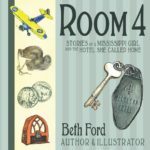 Each one of the stories captures a bit of Southern history and a child’s reaction to a world event… or a humorous observation of little Ella Beth’s recounting of her life in a bustling hotel in a small Southern town. The small 1930’s radio is a typical symbol of communication in those days of how we heard the news and illustrates another global event. H.G. Wells’ book The War of the Worlds performed by Orson Wells and a cast of radio actors, electrified the world and a global panic ensued! This story is “The Broadcast”, which is about a Martian invasion and a fierce battle taking place on our planet. Since “Radio was King” and TV was in the future, the images were only “seen” in the minds of terrified people all over the world. The 50 plus colored pencil illustrations were visualized by me, Beth Ford: Award-Winning Florida artist and author of Room 4. This is my first book. The Polk Museum of Art will be featuring a retrospective of Florida artist and octogenarian Beth Ford. Featured in the Ledger and Murray galleries. Copyright © 2017 - 2018 Beth Ford - All Rights Reserved.